Accurate representations of Adolescent or Adult Grief in the media are few and far between so when a movie or television series comes along that attempts to portray both grief specialists like me pay attention. The arrival last year of This is Us was one such occasion. For much of the entire first season the fact that Jack, the patriarch of the family, had died was part of the story line but the cause of his death was not revealed. There were only a few, veiled glimpses of the grief reactions the teen-aged family members experienced at the time of death and again as adults in the ensuing years during the first season. Ardent fans were left wondering “what happened to Jack?” at the close of season one. Thankfully this changed in Season 2 when the traumatic event that caused Jack’s death was finally revealed in all its heart wrenching detail. Not only did we see the cause of the housefire (a faulty crockpot) but we witnessed the acts of heroism by Jack that resulted in his entire family including the dog being spared. You didn’t have to be a grief specialist to know that Jack’s decision to go back into the burning flames to rescue young Kate’s dog was going to cause a world of emotional pain for Kate for years to come. The actor playing Jack’s wife, Rebecca, did an admirable job of reacting to the news her husband had died unexpectedly while she had a brief respite at a vending machine in the hospital. Grief alert! —Rebecca would experience a “‘would’ve, could’ve, should’ve” moment, so common to grievers, leaving her wracked with guilt. One of the most important teachings grief specialists want others to know is that grief doesn’t conform to any uniform stage model but is instead unique for each human being. This is Us shows us how differently each of Jack’s three adolescent children grieve his sudden, traumatic death. Kate: Jack’s darling daughter was truly the apple of his eye. Jack encouraged her passion for music and literally would have and did do anything he could out of love for his Katie including going into his burning house for her beloved dog. Jack’s decision, however unselfish it was, would ultimately cause a world of pain and guilt for Kate, who for the next 20 years blamed herself for his death. Her mother attempts to ease her daughter’s pain by saying, ‘but your dad made the decision and it was his choice to go into the house. It’s not your fault’ did nothing to ease Kate’s guilt. Kate attempted to cope with her grief by self-soothing with food. Without her father to encourage her, she gives up her dream of becoming a professional singer. When we meet Kate as an adult, her weight has become a way of keeping men at a distance (other than her brothers) so that she would never, ever love and lose again. Kevin: Already depressed because of his football accident, teen-aged Kevin was distancing from his father and was not home the night of the fire. When he learned about his father’s death he blamed himself for not being there to help his family and felt that if he had been there his father would not have died. He projects his self-loathing onto his brother Randall and blames Randall for ‘not being man enough to keep dad from going back into the house for the dog’. It is revealed in Season 2 that adult Kevin uses alcohol and prescription pain meds to cope with all his negative emotions especially his grief and loss over his relationship with Sophie and his father’s death. Randall: is portrayed as the perfect child. As a teen he channels his feelings of abandonment into his school work and copes with his self-doubt by becoming a control-freak. This method had served him well according to societal norms until his birth father shows up in Season 1. When Randall develops a loving relationship with his biological father and then he dies from cancer many emotions which Randall had sought to suppress arise which then cause him to rethink his priorities. Fortunately for Randall, he has married the right woman, who is understanding, supportive and whose sense of humor and love for Randall can help him get through even the worst of times. Randall learns to forgive his Mom for keeping her knowledge of his birth father from him. He is always accepting of Kevin, even when he endangers his daughters by driving under the influence of alcohol and he recreates himself by finding ways to do good for others with his God-given talents. 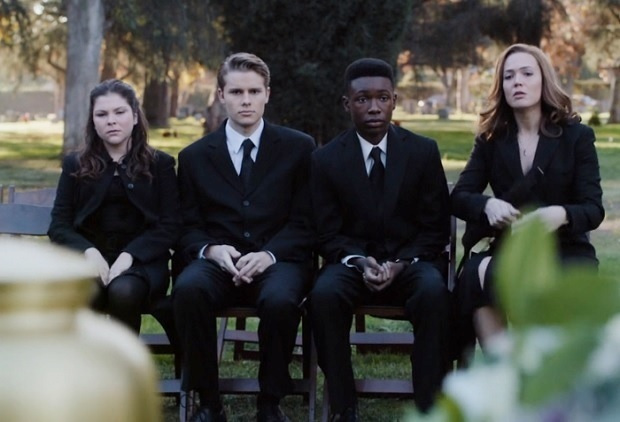 Grief specialists are also grateful that This is Us highlights the benefits of maintaining on-going mourning rituals and continuing bonds with the deceased. Although twenty years have passed since Jack died, Rebecca still bakes her lasagna for Super Bowl Sunday dinner, even if she must some years eat it alone, since that was their tradition. Kate has her father’s ashes in an urn on her mantel and watches football with “him” on Sundays. Additionally, Kate hasn’t wanted a dog since her father’s death, but does ultimately get one ostensibly for her fiancé Toby which is a big step forward in her own healing process. Kevin visits his father’s favorite tree, which we learn is where some of his ashes were scattered. He talks to his father and has on-going work to do in his recovery and therapy before he can be truly available for a loving relationship. But what we, grief specialists are most grateful for is the honest, raw, heart-felt and yes, entertaining portrayal of a grieving family that helps grievers in the viewing audience feel a little less isolated. Perhaps these viewers can see themselves in one of the teen or adult siblings, or in one of their partners or in Rebecca and know that what they are experiencing isn’t crazy or wrong. Maybe This is Us will ultimately help the grievers in the audience feel a little more hopeful at the end of the season and that they will too find a way to survive their unspeakable losses. Lauren, a nationally recognized authority on Children’s Grief, has provided trainings for mental health clinicians, educators, clergy, health care providers and graduate students throughout the community since 2000. Lauren is the author of "Children Grieve Too: A Handbook for Parents of Grieving Children". She also created “My Memory Book…for grieving children” as well as grief-related curricula for use at Camp Erin Los Angeles and in OUR HOUSE grief support groups. Lauren is the Associate Producer of “One Last Hug…and a few smooches” an Emmy award winning HBO documentary about Children’s Grief. She trains and supervises OUR HOUSE group leaders as well as MSW and MFT clinicians and students. Lauren maintains a private practice in Los Angeles specializing in grief and loss. •	Talking to children after sudden deaths due to homicide, suicide, overdose or acts of terrorism- the more stigmatized and unusual the circumstances of the death the less likely adults are to feel comfortable talking to their children about the cause when someone they love has died. •	Children need to be told the truth in age appropriate language because they always find out the truth and they will feel anger, resentment or a lack of trust towards those who weren't honest with them if they aren't told the truth. •	Helping grown-ups understand how to explain these types of death and how to empower their children to create their own narrative so they can comfortably talk about it with friends. •	"Children Grieve too: A Handbook for Parents of Grieving Children." •	Associate Producer of “One Last Hug…and a few smooches” an Emmy award winning HBO documentary about Children’s Grief.